The best days start off healthy. They tend to lead to better decisions, greater clarity and are generally more productive. Not every day starts out that way given the hundreds of variables from stress to travel that make it hard to have those golden days, but I cherish the days that I actually start off well. When I have a good morning I try to switch it up in the kitchen and put a little extra effort into breakfast. It's about being thoughtful to my body and giving it what it needs right away. Power Pancakes, a healthy spin on the tasty classic, have been a go-to for when I get sick of eggs or smoothies. It's the easiest recipe with very few ingredients and consists of healthy substitutions that make it a better option than regular pancakes. I even took it a step further recently when I discovered the most beautiful bottles of edible flora just begging to be included in meals. I picked lavender for this recipe since I was doing a light yoga that morning and wanted to start the day off feeling calm. Spray skillet with cooking spray (PAM makes an organic one now!) 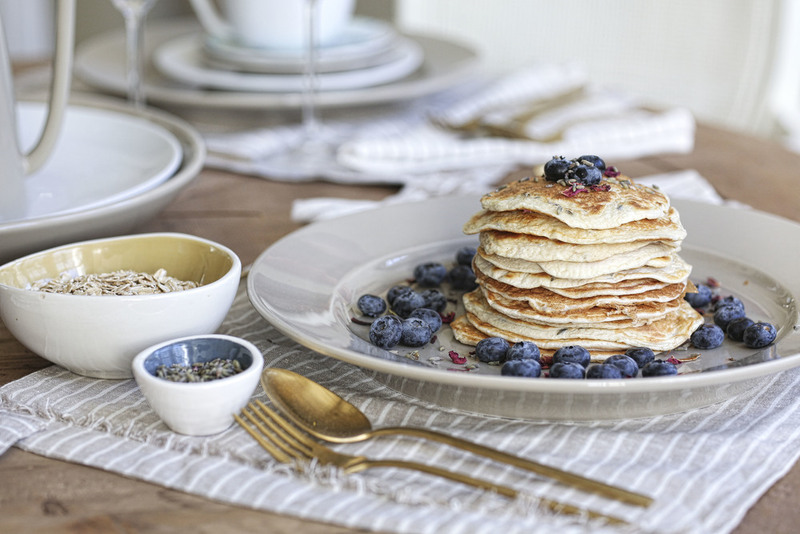 Cook in small silver dollar size pancakes and garnish as you desire! These are light enough to not weigh me down for the day but give me enough energy to fuel a yoga workout outside. It's still pretty warm down here but starting to have a little chill in the air so I'm reaching more for my full leg leggings (these are Express EXP Core) and I'm continuing my love affair with strappy back bras. Maybe it's all the lavender in the pancakes that attracted me to the purple on this one! It's awesome because it's pretty flexible and stretches with me rather than digging into my skin. Just a little something to start the year off right. I'm going to try to incorporate more recipes this year so stay tuned for more! Happy 2016!